Dr I N Silva, Department of Paediatrics, Faculty of Medicine, Federal University of Minas Gerais, Avenue Alfredo Balena 190, 30130–100 Belo Horizonte, MG, Brazil. The influence of 15 or 25 mg/m2 of daily oral hydrocortisone with fludrocortisone 0.1 mg/day on growth and laboratory findings was evaluated in a prospective randomised crossover trial over 12 months in 26 children with 21-hydroxylase deficiency. Nine non-salt losers had fludrocortisone stopped for a further six month period. Height velocity was significantly decreased during treatment with 25 mg/m2 as compared with 15 mg/m2. This was the most sensitive indicator of corticosteroid treatment excess. A dose dependent effect upon plasma concentrations of 17-hydroxyprogesterone, testosterone, and androstenedione was found but increased values were still detected in more than half of the determinations made during the 25 mg/m2 period. Height velocity and 17-hydroxyprogesterone concentrations were positively correlated. Growth hormone response to clonidine stimulation and insulin-like growth factor-1 concentrations were both within reference values and there was no difference between treatment periods. Withdrawal of fludrocortisone did not result in any difference for the non-salt losers. It was concluded that 25 mg/m2 of hydrocortisone depressed growth in children with congenital adrenal hyperplasia, and that full suppression, or even normalisation, of plasma concentrations of 17-hydroxyprogesterone and androgens should not be considered a treatment goal, but instead an indication of corticosteroid treatment excess. Corticosteroids are successful as replacement treatment for children with congenital adrenal hyperplasia (CAH). In 21-hydroxylase deficient children, electrolytes become normal and progression of virilisation is halted soon after treatment starts. Maintaining normal growth velocity remains a challenge, however. Long term follow up studies show that patients with CAH fail to achieve their predicted final heights.1-3 Growth impairment has been attributed to the various corticosteroid schedules employed.4However, individual differences in treatment needs make this difficult to evaluate. Although plasma concentrations of 17-hydroxyprogesterone (17-OHP) and androgens are frequently used to monitor treatment, there is great variability in those concentrations,12 which hampers the usefulness of the tests. We compared the short term effect of two hydrocortisone treatment doses on growth velocity and plasma concentrations of 17-OHP, testosterone, and androstenedione in children with 21-hydroxylase deficiency. We carried out a prospective randomised crossover trial for 12 months in 26 children (18 girls) with the classic form of CAH due to 21-hydroxylase deficiency. Their ages were 3.6 months to 15 years (median 45.3 months). They had been treated previously with hydrocortisone or prednisone for periods of three months to 14.5 years (median 38.5 months) before the trial began. Ages at diagnosis were 0 to 79 months (median 2.5). None of the patients had reached final stature, with all estimates of bone maturity under 14 years (left wrist, Greulich and Pyle). Children were Tanner puberty stage I, except for four girls who were stages III or IV.13 Nutritional evaluation at the start of the follow up showed normal caloric and protein intake. After a three month observation period while on their previous medication, all 26 children were randomised to receive either 15 or 25 mg/m2 daily of oral hydrocortisone with fludrocortisone 0.1 mg/day for six months and then had their dose schedule switched (crossover) for another six months. These doses represent the average and upper limit of what is usually recommended. The hydrocortisone was divided into three daily doses. Nine of the 26 children were non-salt losers and had their fludrocortisone stopped for a further six months, to complete 18 months of follow up. Each child was examined every three months by the same physician (who was unaware of the hydrocortisone schedule), to evaluate height, growth velocity, weight gain, and the presence of signs of virilisation and/or glucocorticoid excess. Physical examination focused on the appearance or increment of body hair and acne, deepening of the voice, abnormal weight gain, or changes in lean body mass as well as abnormal blood pressure and menstrual irregularities. Morning fasting plasma concentrations of 17-OHP, testosterone, and androstenedione were determined at each visit, after the first hydrocortisone dose given at home. Patients were also submitted to a functional evaluation of growth hormone secretion, basal, and 75 minutes after oral clonidine (0.15 mg/kg). Plasma concentrations of insulin-like growth factor-1 (IGF-1) were determined at the end of each six month period. After thorough explanation, all parents or legal guardians gave written informed consent to their children participating in the study. Means of the differences of height for age and weight for age z scores between the beginning and the end of each treatment period were compared using the two tail paired Student’s t test. The National Center for Health Statistics standards were used as reference population indices.19 The possibility of a carryover effect of the first over the second hydrocortisone treatment period was evaluated by F statistics.20 The steroid and the growth hormone values for each period were represented by the mean of approximately 52 hormonal determinations (two for each of the 26 children). The paired Student’s t test was used for comparisons. Growth and plasma steroid determinations from the four pubertal girls were analysed separately. Rejection of the null hypothesis was set at 5% (p<0.05). The mean height and weight z scores of the two randomised groups at the beginning of the trial were not significantly different. Figure 1 shows the statural growth of the 22 initially prepubertal children during the two study periods. There was a significantly (p=0.02) greater increase in height while using 15 mg/m2(mean (SE) z score = 0.28 (0.11)) as compared with 25 mg/m2(−0.06 (0.12)). Figure 1 also shows the statural growth of the whole group (n=26). There was a similar pattern of growth with significant increases in height (p=0.03) during the 15 mg/m2hydrocortisone period (z score = 0.18 (0.11)) when compared with the 25 mg/m2 period (−0.10 (0.10)). Comparison of the statural growth during the two hydrocortisone dose schedules was possible due to a non-significant carryover effect (p=0.63). Because this effect was significant for weight gain, the comparison was made only for the first six months of the trial, with no differences being detected (0.15 (0.54) v 0.02 (0.57), respectively for the 15 and the 25 mg/m2, p=0.55). Differences of height for age z scores (mean, SE) for CAH children between the beginning and the end of each six month treatment period with hydrocortisone, 15 or 25 mg/m2 daily. (A) 22 children, excluding four pubertal girls; (B) all 26 children. 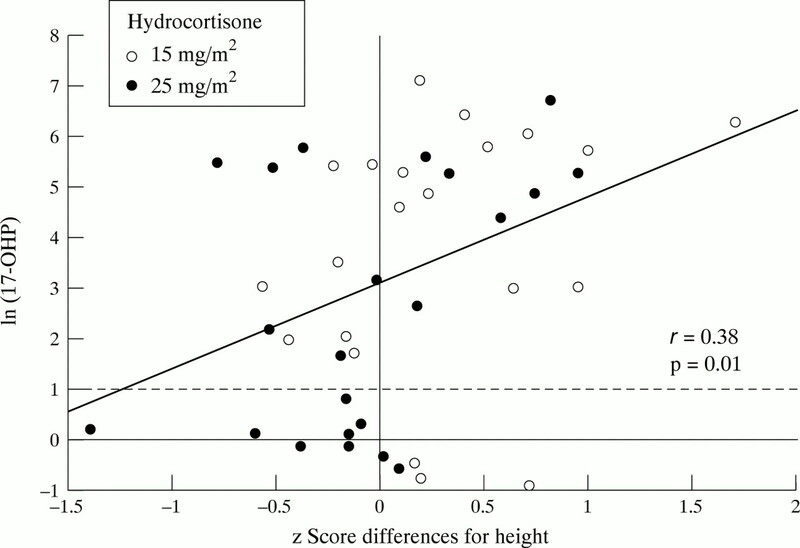 Plasma steroid evaluation showed a variable pattern that was partially related to the hydrocortisone dosage (table 1). The most striking variations were observed for the four pubertal girls. We observed dose dependent hydrocortisone suppression of plasma concentrations of 17-OHP and androstenedione for the 22 children. 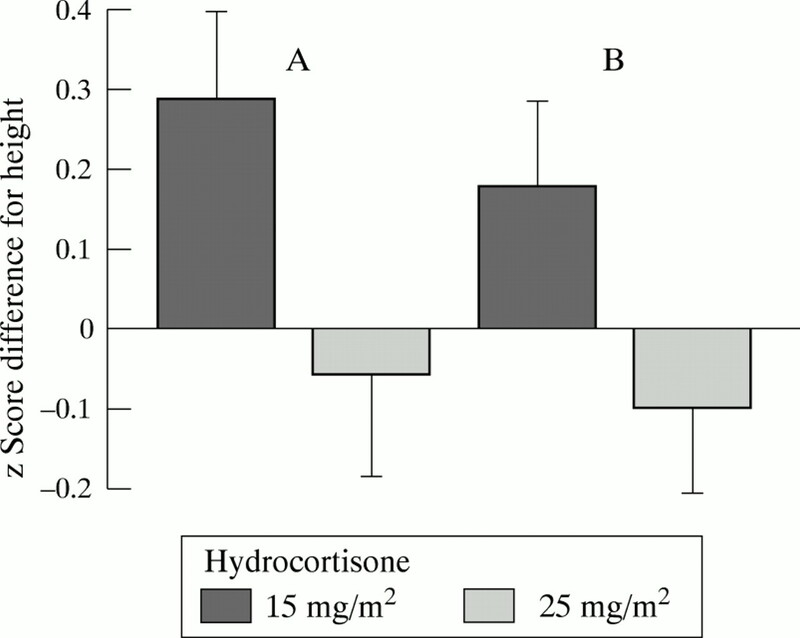 The lowest concentrations were associated with the 25 mg/m2hydrocortisone dose (table 1). Testosterone concentrations did not change significantly. Growth velocity and 17-OHP concentrations were positively correlated (fig 2). The regression line crosses the y axis (natural logarithms of 17-OHP) at 3.04, indicating that optimal growth velocity (z score difference = zero) occurred with average plasma concentrations of 17-OHP around 21 nmol/l. We observed no such association with androgens. Peak and increment growth hormone secretion after clonidine stimulation and IGF-1 concentrations were not different in the two study periods (table 1). Correlation between 17-OHP values (natural logarithms) and height for age z scores of 22 CAH children after six months of treatment with hydrocortisone, 15 (open circles) or 25 mg/m2 (closed circles) daily. The diagonal line represents the regression curve and the horizontal dashed line the upper limit of the reference values. No differences in height for age (−0.23 (0.24) and −0.20 (0.22)) or weight for age (−0.04 (0.45) and −0.06 (0.38)) z scores were observed for the nine non-salt losers six months after discontinuation of fludrocortisone when compared with the previous six months (while on fludrocortisone and the same hydrocortisone dose). There were no difference in the laboratory data between these two periods. We detected mild hypertension in two children (8%) without renal or cardiac dysfunction. During follow up, blood pressure became normal in both. Hirsutism, acne, and weight gain were reported by one child (5%) regardless of the hydrocortisone schedule being used. Three girls out of the 22 children who began the study on Tanner’s stage I reached stages II and III after six to 15 months. The four initially pubertal girls presented with menstrual irregularities. Many reports have shown poor height prognosis for CAH treated patients. Mean final heights achieved by 282 adults ranged from z score = − 0.67 to −2.2.1-3 5 21-25 Several investigators have advocated reducing the hydrocortisone replacement dose,9 10 mainly to increase final height by reducing any detrimental influence of pharmacological doses of corticosteroids on growth velocity. Recent studies concerning adrenocortical production of cortisol showed that its physiological secretion rate is much lower6than previously considered.28 Thus, children with CAH are possibly being given hydrocortisone in excess of their needs. This limited term follow up of 26 children with CAH showed a significant decrease in growth velocity during the six month period of treatment with 25 mg of hydrocortisone/m2 as compared with the 15 mg/m2 dose period. These results indicate that doses of hydrocortisone in the upper limit of the frequently recommended range are not adequate. Also remarkable was the fact that a decrease in growth velocity was the most sensitive clinical indicator of corticosteroid excess. Clinical signs of virilisation or hypercortisolism were rather scarce, if any, making recognition of drug excess difficult. The present study was unable to show any relation between changes in growth hormone or IGF-1 and growth of children with CAH. Growth hormone response to clonidine stimulation and plasma concentrations of IGF-1 were both within laboratory reference values and no differences were detected between the two periods of hydrocortisone intake. Withdrawal of fludrocortisone did not result in any significant difference in growth velocity or laboratory data for the nine children without clinical evidence of salt loss. In our study, however, we observed that even high doses of hydrocortisone (25 mg/m2 ) were unable to fully suppress or even normalise the adrenal production of 17-OHP and androgens. There was a dose dependent effect upon the plasma concentrations of these steroids, but increased values were still present in more than 50% of the determinations during the 25 mg/m2 dose period. The steroid concentrations in late puberty were specially unresponsive to hydrocortisone treatment in current recommended doses. Partial or incomplete adherence to the treatment regimen is often used to explain the variable steroid results in CAH treated patients.22 However, this seems unlikely in the present study because the effect of hydrocortisone intake on growth velocity was quite evident. In addition, the rhythmicity of adrenal steroid secretion32 makes a single morning plasma sample an unreliable marker of the metabolic status of these children throughout a 24 hour period. A positive relation between the plasma concentrations of 17-OHP, but not of androgens, and growth velocity was shown. It suggests that smaller hydrocortisone doses may be beneficial to growth. In a regression analysis we detected optimal growth velocity (z score difference = zero) in the presence of 17-OHP concentrations about seven times the reference values for children. We consider this observation should be taken into consideration in the follow up of children with CAH. Because of the trial design, generalisation for a better prognosis for final height cannot be inferred from our data. It remains to be established whether and how the supranormal concentrations of androgens would affect bone age and ultimate growth. Though proposed,33 a specific adrenal androgen secretion controller has not yet been isolated. Therefore, longer term follow up studies with lower doses of hydrocortisone are needed to evaluate the final height of patients with CAH. We conclude that the current upper limit of hydrocortisone treatment doses for treating children with CAH is harmful to growth velocity at least on short term follow up. Because hydrocortisone doses high enough to compromise growth do not necessarily suppress steroid overproduction, full suppression, or even normalisation, of 17-OHP and androgen plasma concentrations should be avoided. Normal laboratory values should not be considered a treatment goal, but instead an indication of excessive corticosteroid treatment in these patients. We thank Dr Enrico Antonio Colosimo from the Department of Statistics, Federal University of Minas Gerias (Belo Horizonte), for helping with the statistical analysis. (1986) The effect of treatment on final height in classical congenital adrenal hyperplasia (CAH). Acta Endocrinol Suppl (Copenh) 279:305–314. (1978) Adult height and fertility in men with congenital virilizing adrenal hyperplasia. N Engl J Med 299:1392–1396. (1988) Growth and final height in classical and nonclassical 21-hydroxylase deficiency. Acta Paediatr Jpn 30 (suppl) 79–88. (1992) Female pseudohermaphroditism. Semin Perinatol 16:299–318. (1977) Growth patterns in congenital adrenal hyperplasia. Correlation of glucocorticoid therapy with stature. in Congenital adrenal hyperplasia. eds Lee PA, Plotnik LP, Kowarski AA, et al. (University Park Press, Baltimore), pp 247–263. (1990) Cortisol production rate in childhood and adolescence. J Pediatr 117:892–896. (1990) Cortisol production rates measured by liquid chromatography/mass spectrometry. Steroids 55:152–158. (1993) Estimation of daily cortisol production and clearance rates in normal pubertal males by deconvolution analysis. J Clin Endocrinol Metab 76:1505–1510. (1988) Management of congenital adrenal hyperplasia. Arch Dis Child 63:1399–1404. (1994) Genetics, diagnosis, and management of 21-hydroxylase deficiency (clinical review). J Clin Endocrinol Metab 78:241–245. (1995) Growth patterns and outcomes in congenital adrenal hyperplasia; effect of chronic treatment regimens. N Z Med J 108:311–314. (1994) Morning steroid profile in children with congenital adrenal hyperplasia under different hydrocortisone schedules. Indian J Pediatr 61:341–346. (1969) Variations in pattern of pubertal changes in girls. Arch Dis Child 44:291–303. (1980) Radioimunoensaio da 17-alfa-hidroxiprogesterona no soro: considerações metodológicas. Arq Bras Endocrinol Metabol 24:24–30. (1974) A simple radioimmunoassay for testosterone. Am J Obstet Gynecol 118:114–119. (1981) Desenvolvimento de um método radioimunológico simples para a dosagem de androstenediona no soro. Arq Bras Endocrinol Metabol 25:47–50. (1987) Radioimmunoassay of the somatomedins/insulin-like growth factors. in Radioimmunoassay in basic and clinical pharmacology. eds Patrano C, Peskar BA (Springer-Verlag, Berlin), pp 561–574. (1990) Monoclonal antibody-based immunoenzymometric assay for human growth hormone. Braz J Med Biol Res 23:293–296. (1979) Physical growth: National Center for Health Statistics percentiles. Am J Clin Nutr 32:607–629. (1989) The 2*2 cross-over trial with continuous data. In: Jones B, Kenward MG, eds. Design and analysis of cross-over trials. (Chapman and Hall, London), pp 16–84. (1977) Glucocorticoid treatment of girls with congenital adrenal hyperplasia: effects on height, sexual maturation, and fertility. J Pediatr 90:996–1004. (1991) Congenital adrenal hyperplasia caused by 21-hydroxylase deficiency. Its molecular basis and its remaining therapeutic problems. Endocrinol Metab Clin North Am 20:277–297. (1993) Temporal and individual variations in the dose of glucocorticoid used for the treatment of salt-losing congenital virilizing adrenal hyperplasia due to 21-hydroxylase deficiency. Acta Paediatr Suppl 388:56–60. (1989) Growth and body proportions in congenital adrenal hyperplasia. Arch Dis Child 64:1554–1558. (1992) Evaluation of young women with congenital adrenal hyperplasia: a pilot study. Horm Res 37 (suppl 3) 45–49. (1971) Linear growth and growth hormonal responsiveness in treated congenital adrenal hyperplasia. Am J Dis Child 122:408–413. (1983) The effects of long-term normalization of sodium balance on linear growth in disorders with aldosterone deficiency. Acta Endocrinol 102:577–582. (1966) Cortisol production rate II. Normal infants, children and adults. Pediatrics 37:34–42. (1989) Monitoring treatment in congenital adrenal hyperplasia. Arch Dis Child 64:1235–1239. (1978) Serum androgens as a continuing index of adequacy of treatment of congenital adrenal hyperplasia. J Clin Endocrinol Metab 46:452–458. (1979) The use of plasma androstenedione in monitoring therapy of patients with congenital adrenal hyperplasia. J Pediatr 95:33–37. (1981) Circadian patterns of plasma cortisol, 17-hydroxyprogesterone, and testosterone in congenital adrenal hyperplasia. Arch Dis Child 56:208–213. (1989) Control of adrenal androgen secretion. In: Parker LN, ed. Adrenal androgens in clinical medicine. (Academic Press, San Diego), pp 30–57.